The 100‘s Richard Harmon and Sachin Sahel were teamed up for interviews at the 2019 WonderCon in Anaheim. 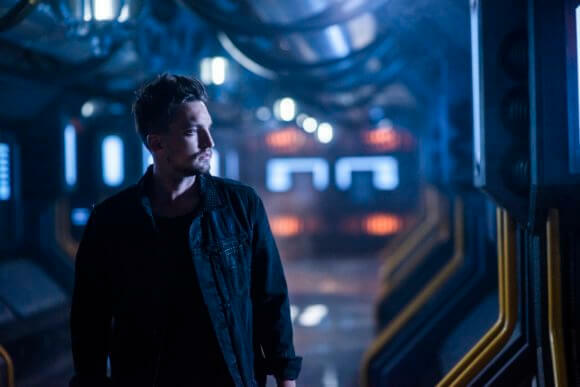 Richard Harmon stars as John Murphy and Sachin Sahel plays Dr. Eric Jackson in the popular sci-fi drama which will return to The CW’s primetime lineup on April 30, 2019. The sixth season will find the survivors attempting to create a community on a new world. Episode one of season six is titled “Sanctum,” the planet that will provide the group shelter after Earth was made uninhabitable. During roundtable interviews, Harmon and Sahel discussed their characters, Murphy’s relationships with Clarke and Jordan, and actors who’ve come and gone from the series. Murphy’s described as the cockroach of The 100. How would you describe your character? How was the fan reaction to the screening of the season six premiere? Will there be a lot more Murphy and Clarke scenes with Murphy not forgiving her for the events in season five? Murphy and Jordan have a relationship this season where he’s kind of like Uncle Murphy. How do you describe it? Richard Harmon: “I think it’s an interesting relationship between him and Jordan because it’s hard for Murphy to look at him because he reminds him so much of his dad and his mom, specifically his dad. I think that’s a relationship that Murphy will miss is him and Monty, even though he never would have said it to Monty’s face. I think he had a lot of love for him and respect for him. So, I think he’s protective of Jordan in a different way than like let’s say Clarke is with Madi. This season Jordan’s the new kid and everything is new to him. Will there be some kind of hazing? We’ve lost so many characters over the years. Are there any you really miss?